Get those photos back in your life, create a Year In Review Book! Looking at family photographs on a screen doesn't have the same feeling as looking at photos in a tangible book. Do you remember flipping through photo albums? Do you find yourself feeling happy and nostalgic when you visit a loved one and looking at your childhood or family photo albums? When we went digital we stopped printing photographs, the photos sat on the computer rarely enjoyed and shared. A number of years ago I decided that I would create a book for each year - a Year in Review album. As a family we love to travel and we take a lot of pictures when we are exploring new places. So every January my project is to create our Year in Review photo book and I’ll share my tips with you. With your photographs, the places you went, the people that you met and the memories that you created. Here are some tips to help you with this project. It may sound like a big task - but doing a little bit throughout the year will make it easier. Review your photographs every month as they come in, it’s much easier to review 4 weeks of photos rather than 52.
Review your photos every month and decide which you will keep and delete the bad and multiple shots now! Rename - using the year-month-day-who-what-where naming convention will allow you to retain important information about your photographs. Your photographs will be ordered chronologically and you will have all of the information about the photograph, it’s hard to remember all of those details as time goes by! It’s like writing on the back of the photographs. Rate and Tag your photos - most photo organizing software allows you to rate your photos, tag those shots that are special to you and that are worthy of being added into your book, the rest can be kept as your backup photos. Use a consistent rating / tagging system through the year so that you can easily identify what will go into your photo book. Utilize your software - Add those winning shots into a smart album or folder within your photo organizing software called “2016 Year in Review”. At the end of the year you will have a smaller collection of photos to choose from when it comes time to create your book. As this particular book is the year in review, your layout is likely chronological. Start in January and work your way through the year. Add a little bit of text - a short paragraph outlining the highlights of the year. Travel, special events or visitors that were hosted. 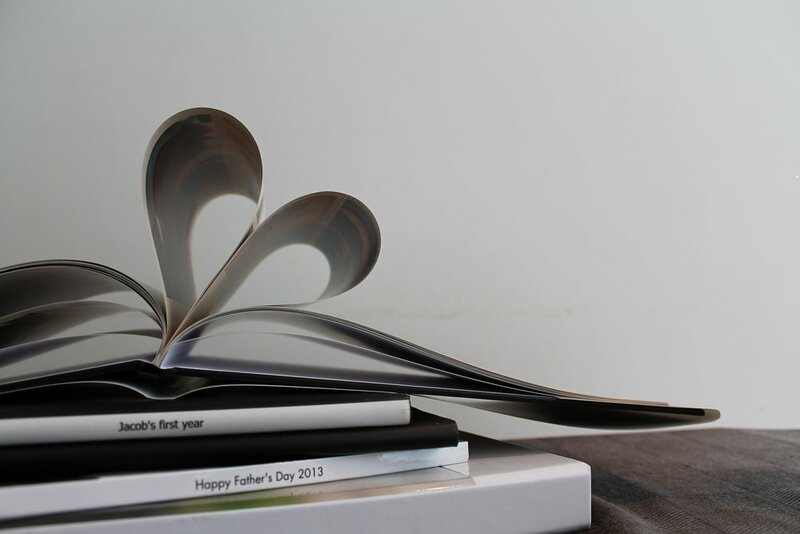 There are many different options to choose from when creating a photo book to suit every budget. Hard cover, soft cover, small or large formats. Many provide templates, with preset themes into which you can simply drop your photos into an allocated spot. My personal preference is to have a consistent look for all of my photo books, I choose a blank book and then pick my background colours and layouts. I encourage you to add text - a few words about where your were, who you were with, or what the celebration was. As time goes by the details become hard to remember, and if someone picks up your book - the key details are there for them to “read your story”. Now that your book is done it’s time to enjoy and share it. It’s easy to order an extra copy for a family member too. Sounds like a great idea, but don’t know where to start? It is normal to have this feeling, so many years to get through. My advise is to start with the most recent year and then tackle the previous years, one year at a time.